Built in 1893, this 37-room mansion was home to the John A. and Margaret Thatcher family and named for Mrs. Thatcher's favorite flower. It remained a family residence for 75 years. Designed by noted New York architect Henry Hudson Holly and two years under construction, the mansion was completed in 1893. Nearly all furnishings, accessories, decorative arts, paintings, custom paneling, wall and window treatments are original to the home. Guided tours begin on the half hour throughout the day, with the exception of special events and the last two weeks of the holiday season when self-guided tours are utilized. 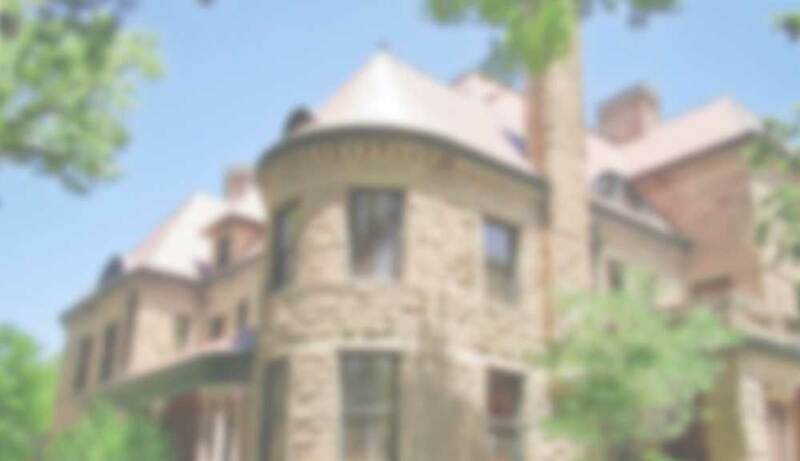 See why Rosemount has been called "Colorado's Crown Jewel," and why it was selected for showing on the A & E cable network's nationally televised *America's Castles* and the HGTV Series *Christmas Castles*. Find directions to the museum here. For more information and specific dates on any events on this page, be sure to check our updated calendar. The museum is closed during the month of January for heavy-duty house cleaning. The staff is working, but public tours are not available. The museum opens for the new season. Historic Preservation Day is held in May and normally falls on the 2nd Saturday of the month. This is a discounted day at the museum. There are no regularly scheduled events in August. There are no regular events scheduled in September. Rosemount Museum rents the grounds and east veranda for weddings and other outdoor events. The inside of the museum itself is not available for weddings or receptions. Wedding ceremonies can be conducted on the veranda or the outside grounds, and small receptions can be booked in the Carriage House. Receptions or dances are not allowed on the veranda due to liability issues. The museum is only available May through September for weddings and other outdoor events. Weddings are booked only after January 5th of each year. Tentative dates can be held prior to the end of the year once the museum has set its calendar for the next year. Tentative dates can only be held through the approval of the Museum Director. Official dates can be held beginning January 5 with a deposit and signed contract. Fees are based on a sliding scale determined by the number of hours the property is used and the number of people the event brings to the property. The basic cost for a 2 to 3 hour event with 100 or more people is $300 for the deposit and $600 for the rental fee. Fees go up or down based on the individual situation. Deposits are due when the date is booked and the rental fee is due 30 days prior to the event. The deposit is returned two weeks after the event. Photos can be taken anywhere on the outside of the grounds by those getting married on the property and those getting married somewhere else, and for family, graduates and other photo opportunities, however prior permission is required. Alarms are set on all of the museum porches when the museum is closed. These porches are off limits if the museum is closed but can be accessed if the museum is open. Certain dates or times may not be available if the museum has the property rented for a wedding or other outdoor event. PLEASE CALL AHEAD TO GET PERMISSION. Photos can be taken inside the mansion with prior permission from the Rosemount Board of Directors and the Director. A $250 fee is required to take photos inside the mansion. The Patrons of Rosemount are the mainstay of this non-profit institution. Each year, membership donations provide support toward the preservation of one of America's finest examples of the Victorian era. Rosemount currently benefits from the faithful service of about 40 volunteers. But the museum is always looking for volunteers to help with tours, research, presentations at local schools, educational program assistants, gift shop clerks and living presenters. Volunteers benefit by acquiring new skills, working in the elegant atmosphere of the Victorian era, meeting new people from throughout the country, serving as a museum representative and helping preserve the traditions represented by Rosemount. If you are interested in becoming a volunteer, please inquire by calling the museum at (719) 545-5290 or use our Get Involved Form. If you are interested in becoming a member, please inquire the museum at (719) 545-5290 or use our Get Involved Form below. Includes free museum admission, newsletter, 10% gift shop discount, 10% Veranda and grounds rental discount, invitations to special events and members-only events. Free family admission, newsletter, 10% gift shop discount, 10% Veranda and grounds rental discount, invitations to special events, members-only events and recognition in newsletter. Free family admission, newsletter, 10% gift shop discount, 10% Veranda and grounds rental discount, invitations to special events, members-only events, recognition in newsletter and two free guest passes food for general admission. Free family admission, newsletter, 10% gift shop discount, 10% Veranda and grounds rental discount, invitations to special events, members-only events, recognition in newsletter and five free guest passes food for general admission. Free family admission, newsletter, 10% gift shop discount, 10% Veranda and grounds rental discount, invitations to special events, members-only events, recognition in newsletter, ten free guest passes food for general admission or a $25 gift certificate to the Carriage House Restaurant. Five free admission passes, gift shop discount for holders of passes, newsletter and invitations to special events. Ten free admission passes, gift shop discount for holders of passes, newsletter and inviations to special events. Ten free admission passes, gift shop discount for holders of passes, newsletter, special private tour for up to twenty people and invitations to special events. Ten free admission passes, gift shop discount for holders of passes, newsletter, special private tour for up to twenty people, invitations to special events and company recognition on major donor plaque. The museum gift shop offers a variety of exclusive decorative items, seasonal giftware, estate items and Victorian-style memorabilia. 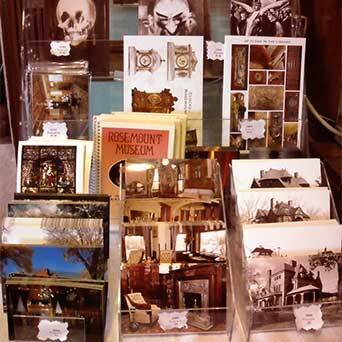 Postcards, cookbooks, Victorian theme books and Rosemount souvenirs are also available. Linger a while after your tour to browse the shop! The Carriage House Restaurant is located on the museum property and was the former carriage house for the Thatcher family. The building is available for catered events. Seating capacity is 60. All events are booked through the museum. Please call 719-545-5290 for information.